Is there a more definitive Steve Martin moment than his 1976 appearance on The Gong Show? The recently revived variety show's original host Chuck Barris stood in a mess of broken glass and spilled milk left behind by a family magic act, clapped hands, and introduced a mysterious character called The Mad Banjo. That's when the curtains parted and Martin was revealed in his "wild and crazy guy" persona. He was dressed in a frill-front tuxedo and accessorized with an arrow-through-the-head headband, and he played Earl Scruggs' classic bluegrass instrumental "Foggy Mountain Breakdown" like a champ until Barris interrupted the performance to tell Martin — who was also appearing as a judge on the show — that he wasn't allowed to be both a contestant and a panelist. Mad drama ensued. Martin — the serious banjo player, not-so-serious magician, notable playwright, bankable movie star, and able deconstructor of funny things — has always worked at the nexus of slapstick, anti-comedy, total entertainment, and show business satire. 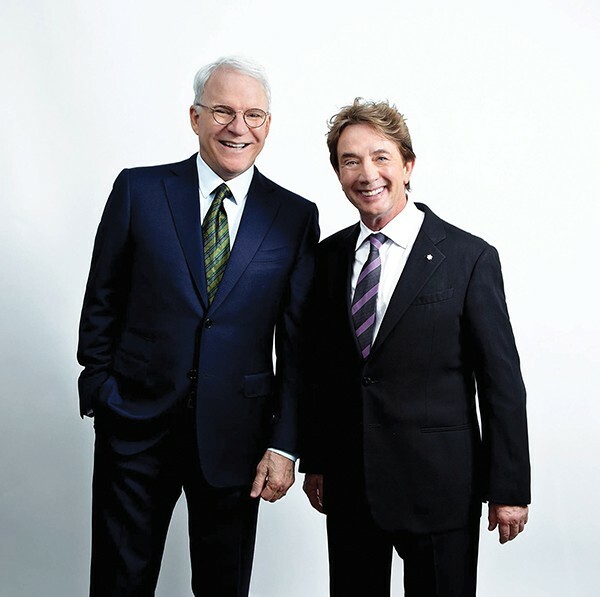 This week, 42 years after The Mad Banjo's big meta-Gong Show moment, Martin is visiting Downtown Memphis with one of the few entertainers who can match his old-school, jack-of-all-trades approach to putting on shows (about putting on shows), Martin Short. An Evening You Will Forget for the Rest of Your Lives arrives at the Orpheum Saturday. It's a multimedia affair with music, film, impressions, career retrospectives, and even a little audience participation. Martin and Short will make jokes at one another's expense and tell true Hollywood stories. They will pick and sing with the Grammy-winning bluegrass ensemble, The Steep Canyon Rangers. And if the show runs short by five minutes they'll probably encore with everybody's favorite song about contractual obligation, "Five More Minutes to Fill."